Time to Relax, Its Here. Welcome your new DensityComfort weighted blanket with open arms. You can now take full advantage of Deep Touch Pressure Stimulation (DTPS) and allow the blanket to increase your cognitive performance, emotional well-being, physical health, reduce your stress and most importantly, improve your quality of sleep. DTPS works when the blanket stimulates certain pressure points on the body, producing a calming and relaxing sensation. Weighted blankets are engineered to be 8-12% of your body weight to relax the nervous system by simulating the feeling of being hugged or held. This boosts serotonin and melatonin levels and decreases cortisol levelsimproving your mood and promoting a deep restful sleep at the same time, prescription-free. At DensityComfort, weve got you covered. Our weighted blanket can help with. ASD (Autism Spectrum Disorder). Obsessive Compulsive Disorder (OCD). Pain Parkinson’s Disease PDD. Post Traumatic Stress Disorder. Restless Leg Syndrome (RLS). Restless Sleep Rett’s Syndrome. REDUCE STRESS & ANXIETY: Weighted blankets have been scientifically proven and used as an ultimate natural treatment in the medical world for promoting deeper sleep and treating Anxiety, Stress, Insomnia, PTSD, MS, ASD, SPD, ADHD, Aspergers, Restless Leg Syndrome (RLS) and more, prescription-free. SAFE & SECURE: The weighted blanket is made of 100% cotton and its compartments are filled with hypo-allergenic, non-toxic, odorless glass poly pellets for weight. DensityComfort weighted blankets are also more secure, featuring 6 loops to hold the blanket in place when placed into the super soft honeycomb cover. 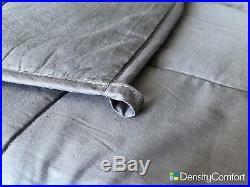 Other brands have fewer loops that let the blanket inconveniently and constantly slide and shift inside the cover. 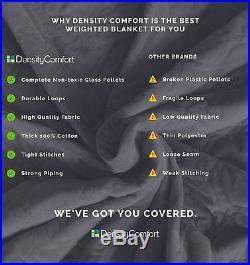 LARGE & COMFORTABLE: DensityComfort is perfect for adults who want a full 60 x 80 size blanket, as opposed to competitors who offer smaller uncomfortable sizes. Our blanket is also ideal for children; simply leave any un-needed weight at the end of the bed or on the floor. 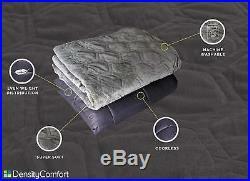 Invest in DensityComfort weighted blankets that fast growing children will never outgrow. Fitting King, Queen, Full and Twin Size beds. CHOOSING YOUR SIZE: A weighted blanket is engineered to be approximately 10% of your body weight to naturally relax the nervous system and reduce stress by simulating the feeling of being held or hugged. We recommend using the 15 lb. Blanket if you are under 170 lbs. And the 20 lb. Blanket if you are 170 250+ lbs. Perfect for anyone up to 67 tall. This will provide you with the most cozy and snuggly experience, especially with our optional super soft honeycomb cover. PREMIUM MATERIALS: DensityComfort only sources the best materials. We use complete glass weighted pellets, strong durable loops to secure the weighted blanket, high quality fabric, thick 100% cotton, tight stiches and strong piping. Competitors often use broken pellets with sharp corners which will destroy the fabric over time, fragile loops that easily rip, low quality fabric which is not as smooth, thin polyester outer fabric, loose seams and weak stitching at the edges. The item “DensityComfort Weighted Blanket 15 lbs 20 lbs Adult Children 60×80 Autism Stress” is in sale since Tuesday, July 24, 2018. This item is in the category “Health & Beauty\Natural & Alternative Remedies\Other Natural Remedies”. 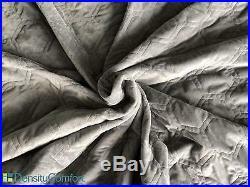 The seller is “lifestyleproductscentral” and is located in New Castle, Delaware. This item can be shipped to United States.